Visualize the scene at the beginning of Tin Cup when Renee Russo shows up for a lesson from Roy McAvoy, played by Kevin Costner, a down and out professional at a down and out driving range. The multiple devices Russo put on looked like something from the Marquis de Sade’s closet and though perhaps a little overdone for dramatic effect, it did get the idea across beautifully. Golfers will try just about anything to get better. Unfortunately very few devices or swing aids are worth the investment especially over the long term. A bewildering array have come and gone making a sure testament to the ingenuity of golfers. Now, having said all that, buy a Swingclick. It’s simple. It works. 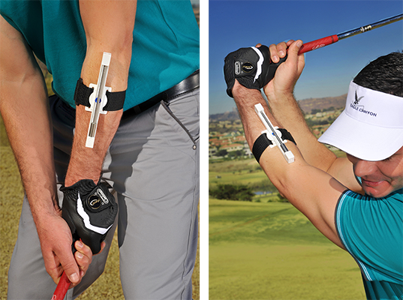 Swingclick helps correct a problem shared by the great majority of golfers, namely not swinging with the proper tempo. They swing out of sync, never “setting the club on top” which robs clubhead speed, contributes to off center hits, glancing impact and a host of other shot-making disasters including the most common of all…the dreaded slice. Swingclick shows you how to fix your tempo. It’s simply a weight on a slide that straps to the left forearm. Swing back to the top, wait for the click of the weight hitting the end of the slide then swing down through the ball listening for a second click at impact and on to the follow through for a third click. When you begin using Swingclick you will probably hear the first click after the start of the downswing revealing you rushed the transition from backswing to downswing plus if the second click comes before the clubhead hits the ball you’ve released too early. Used prior a round it helps smooth out your swing and strike the ball more solidly plus it’s ideal should you want to practice on the course. 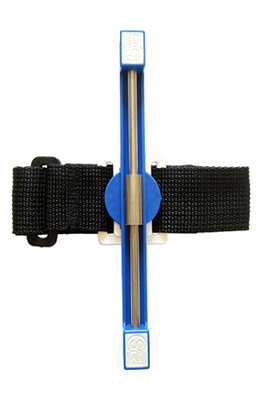 Swingclick received industry kudos at the 2015 PGA Merchandise Show and a number of teaching professionals are already having their students “strap it on.” Find more information at swingclickgolf.com where it can be purchased for $29.95 and it is also available on amazon.com.